Vanessa Hudgens and Vanessa Hudgens star in Netflix&apos;s "The Princess Switch." Published Nov. 28, 2018 at 7:56 p.m.
Not content to merely take over Hollywood, Netflix has now firmly set its sights on also replacing the Hallmark Channel with holiday fluff like "A Christmas Prince," "Christmas Inheritance" and, now this year, "The Princess Switch." Leave Hallmark alone, you big streaming behemoth! What did this shining beam of innocence and Christmas spirit ever do to you? (*glances over at "It's Christmas, Eve*) Oh, OK, actually pillage away. A big-city and/or corporate Vanessa Hudgens arrives in a small town in the hopes of winning a nationally-televised baking contest. In the process, she stumbles into a handsome Princess Vanessa Hudgens but with a British accent who's fallen out of love with the holidays thanks to actually she loves the holidays and simply wants to see what life is like for us normies, but also has a wedding coming up with a frosty prince. Will she win the contest, while also thawing her own frozen, Grinch-like heart? And will they find the greatest Christmas gift of all ... love? It doesn't quite fit. Hmm, the problem here is that I have my standard-issue Hallmark mismatched lovers Mad Libs plot summary when I need my standard-issue Hallmark twins switch places Mad Libs plot summary. Vanessa Hudgens, who was definitely tricked into thinking she was going to be in a "Netflix Original" movie and instead got stuck in a Hallmark movie not winning enough to be on the actual Hallmark Channel. Listen, Netflix releases 17 new movies and TV shows every hour (approximately); they're not all going to be winners. But seriously, Vanessa. You did "Spring Breakers," have a J. Lo rom-com coming out in a few weeks and will star in Fox's upcoming live TV production of "Rent." You don't have to do unglorified Disney Channel original movies anymore! Joining Vanessa Hudgens and Vanessa Hudgens in "The Princess Switch" is Sam Palladio, who looks like the love child of the lead guy from "Homeland" and Benedict Cumberbatch. He stars in the soapy country music TV drama "Nashville," but I've had enough of talking about country music stars lately in this column. Between "A Christmas Prince," "Christmas Inheritance" and now this, there's just something ... off about Netflix's faux Hallmark movies. Even just visually last year's "Christmas Prince" looked wrong, so dark, grey and drab that I found myself desperately yearning for the Hallmark Channel, where every room looks like a Pier 1 exploded inside of it. But even if "The Princess Switch" fixed that with its extremely fancy-looking "hidden gem" Chicago bakeries and royal winter cabins that look like the literal inside of a Crate and Barrel box, there's still something distant, cold and even cynical about the movie. Maybe it's the plot that sounds as if the screenwriter was actually the famed Netflix algorithm, combining the royal romance of last year's holiday hit, the baking battles of "The Great British Bake-Off" and the happy hokum vibe of Hallmark movies – the one where Candace Cameron Bure co-starred with Candace Cameron Bure thanks to the miracles of science, to be specific. Maybe its slightly edgier jokes and material (a shirtless man? WHAT SCANDAL!?) create an odd uncanny valley where it's the timeless sap of Hallmark awkwardly wedged into a much more real world. Or maybe it's just the feeling that Netflix knows it could be spending this money and promotion on something better. Hallmark makes its holiday movies because that's its aesthetic and its spirit, trapped happily in a snow globe. Netflix feels like they make these movies because of calculated business, because bleep bloop the analytics say we should make a hokey Christmas movie. And that's not to say Hallmark doesn't make its fluff for profits, too. (It's named after a brand, for heaven's sake – one it didn't mind shilling for in my last movie, at that.) But Netflix's efforts seem bad at hiding it. They feel like the "Sharknado" of cheesy Christmas movies or a mass-produced ugly Christmas sweater bought at Wal-Mart, all of the dopiness of a bad product but with none of the soul. Or maybe I'm just mad Netflix cancelled "American Vandal." Credit where credit is due: Vanessa Hudgens is working her damn hardest here playing two roles, starring as a Chicago baker who still hasn't gotten over her ex Paul dumping her. Her sous chef Kevin, however, has a way to cheer her up: signing her up for a nationally-televised baking championship hosted by the very real country of Belgravia. But Vanessa couldn't close up shop right before Christmas, could she? Yes, she absolutely could; this is why general managers exist! I think getting global recognition on a baking contest would balance out maybe selling a few less scones. But Vanessa's a stick in the mud who, as Kevin very explicitly points out, can't be spontaneous ... until a magical old man makes her ex Paul and his new girlfriend appear (I think? I don't know if he actually has any powers or if he's just the literal embodiment of fate) and suddenly BOOM we're off to Belgravia! There, in between getting made fun of by Kevin for being organized (how DARE she! ), she runs into her baking arch rival who Vanessa may or may not imply slept with teachers to get good grades? VERY UN-HALLMARK-LIKE BEHAVIOR, YOUNG LADY. More importantly, however, she runs into ... herself. Or at least the princess version of herself: Duchess Vanessa Hudgens of Montenaro. Montenaro? Belgravia? We are basically in "Star Wars." Everyone's just talking in British accents anyways. Just once I'd like to see a pleasant happy rom-com involving royalty in which the princess has a thick Slavic accent or something that sounds more like a cough than language. They can come up with 47 different fake country names, but they all speak Proper Fancy British. Who knew the British Empire took over fictional countries too?! So the two get to swapping places, with Hudgens learning how to walk and talk like a royal and Duchess Hudgens learning how to walk like ... a normal person. (Again, how adorably snobby!) They also learn why they look identical: a distant uncle who fled the country at some point. Indeed – and this one man managed to birth two identical women. Yep, that's how DNA works! That's why every family relative looks identical to all their cousins! Honestly, I'm not even sure of the logistics of this; the movie blazes through it as if, "Bah, who needs to understand why these two random women from opposite sides of the world and of the economic spectrum happen to be identical twins? IT HAPPENS!" As you might expect, love breaks out. Vanessa Hudgens meets her prince, who she actually finds very charming. The two ride horses in front of a green screen together and ride a carriage through a green screen together and visit the royalty-run orphanage where they've never received Christmas gifts. Seems like the Belgravian tabloids would be all over that story: Royals Let Kids Rot In Joyless Toy-less Christmas. I would read that article. But thankfully Vanessa Hudgens is there to convince the royals into buying gifts for the sad orphan kids. There's also a ball where Vanessa is told that she definitely knows how to play the piano, so she and her beloved prince bust out "Carol of the Bells." I love how audiences are always amazed by the most basic songs in these movies. King of England: "I heard you studied music at Juilliard." Things are going just as well with Duchess Vanessa, who learns a lot as a normal person about her new country and new people ... by exclusively hanging out with American tourists also new to the country. She also sparks a romance of her own with Kevin – and not just because he walks into her room without a shirt on, just blasting six-pack abs all over the place. Also, the daughter figures out that Duchess Vanessa isn't Vanessa Hudgens. Looks like Kevin's daughter owns the one collective brain cell in this cast of characters! Both of their relationships get a bump thanks to the help of the reappearing Mr. Fate and glorious product placement. For Vanessa Hudgens, she stops by a toy store where they sell Twister and generic wooden dolls and Twister and wooden planks and the iconic Milton Bradley game Twister. And what else is a fake princess to do when in a toy store with a stranger you've known for two days while wearing an alarmingly short skirt for a royal public figure than play Twister. Good thing nobody photographs or recognizes famed princesses in this universe! Meanwhile, as for Duchess Vanessa, she bonds with Kevin crying over watching ... Netflix's "A Christmas Prince," supposedly Kevin's favorite movie. Oh you shameless brand whores – and I revoke your abs for this, Kevin. I, too, cried while watching "A Christmas Prince," but I imagine it was for different reasons. Of course, our two Vanessa Hudgenses must eventually go back to their rightful places; after all, one has a wedding and one has a baking contest to win – a very competitive one, as it turns out, as Vanessa's rival sneaks in and cuts her mixer's cord overnight. Can't imagine anyone noticing that foul play! Well, apparently Vanessa doesn't as she manages to bake an entire giant festive cake without a mixer until it comes time to make a jam for the inside. Also: How dare you make a show involving baked goods and gives us few to no shots of seductively delicious pastries and cookies? I COULD BE WATCHING "THE GREAT BRITISH BAKING SHOW" YOU JERKS – WITH PEOPLE FROM REAL BRITAIN, NOT FAKE BRITAIN! Of course, she wins the contest (although the archival doesn't get splattered with a large cake as punishment for her treachery, so does anyone REALLY win?) but the princess is in charge of handing out the ribbons, meaning their twin switch gets revealed to the entire world – and, more importantly, to their various newly found loved ones. But, as you imagine, things wrap up tidily – even for the alarmingly creepy bodyguard who tried to out them as traitorous traders for half of the film. OR DO THEY? Because let's do a quick hypothetical situation: Let's say you were platonic best friends with somebody for years and then he falls in love ... with a woman that looks LITERALLY just like you. Wouldn't that be .. weird? Combine that with the two guys being lied and gaslit for most of the movie, and I look forward to the sequel to "The Princess Switch" taking place in couples therapy. In fairness, Vanessa Hudgens is legitimately working hard to charm the audience in this movie with fancy voices and goofy walks and all sorts of the usual forced twin-switch hijinks bending over backwards to bend the truth. All the power to her for not giving a darn about prestige and just having a hoot putting on a voice and some princess-y outfits. She's having fun here. Me? Less so. If I'm going to clog up my veins with made-for-TV holiday cheese, I might as well go to the original source: Hallmark. Reference to a dead relative? Duchess Gabriella Montez's parents both died! WE'RE ALL DRINKING THIS TOGETHER! Christmas-y main character name? Sigh, nothing. The script instead focuses more on giving Vanessa Hudgens a good strong Chicago name to go with her VERY convincing Chicago tourist hat: Stacy Da Bears De Novo. Getcha Head in the Game? More like GETCHA HEAD OUT OF YOUR GLASS! Fake Christmas tree disses? Nothing. Are you getting in on that sweet, sweet Balsam Hill money too, Netflix!? YOU ARE THE SOBRIETY IN ME! Newcomer in old-timey tradition? I mean, traditions don't get much more old-timey than the monarchy – even if it's the fake crowns of Gervakia or Montestoniastein. WHAT TIME IS IT? DRINK TIME! Hot chocolate? "The Princess Switch" is nowhere near cozy and cuddly and Christmas-y enough for a hot mug of hot cocoa. Disappointing. RIGHT HERE RIGHT NO DRINKY! Near-miss kiss? I mean ... technically? In the midst of a snowball fight, Duchess Gabriella Montez biffs it in a snowbank and – you're never going to believe this part – Kevin falls right on top of her trying to help her up. Cue a near-miss kiss, right? Uhh, kind of? They don't have a romantic linger or inch toward each other's face only to be kiss-blocked by the cast's precocious youth. They just ... get back up. What a waste of a good pratfall. WHEN THERE WAS ME AND YOU AND NO ALCOHOL! Product placement? We've already been over the blatant product placement for Twister and Netflix itself that'll drive you to drink even if you weren't playing this game. So allow me to just point out that the cute little toy store in Belgravia is called Frederick's ... which I believe is a VERY DIFFERENT kind of fun toy store here in America. DRINK AWAY! Snowball fight or ice skating? No ice skating, but we do get that aforementioned snowball fight with the non-existent near-miss kiss. So I least I get one drink out of it! I WANT IT ALL – AND BY IT, I MEAN BOOZE! Ugly sweater or tie? Proving once again that the holiday fashion trend for 2018 is the ugly holiday hat, the princess-in-disguise snags some silly Christmas chapeaus for Kevin, his kid and herself. CAN I HAVE THIS DRINK! Big city person in small town? I mean the transition from Chicago to the world of Albanijania would seemingly provide a big city person in a small town vibe, but since Vanessa Hudgens swaps with Duchess Gabriella Montez, we get to hang with the bougier parts of the society. And the city is big enough to host a global baking olympics, so it's looking like a no. BOP TO THE STOP DRINKING! Caroling, tree farming or cookie baking? You bet there's caroling! 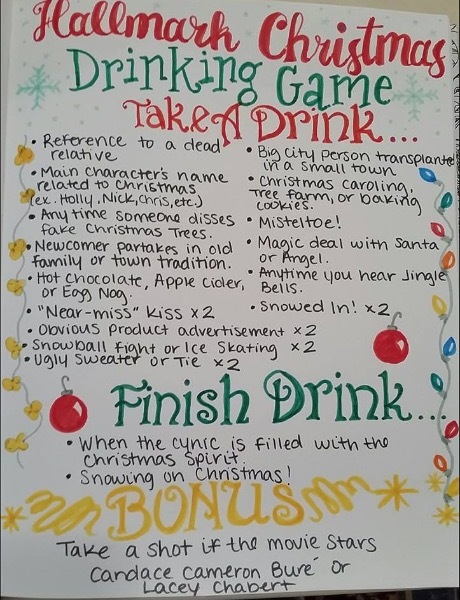 In fact, in comes shortly after the snowball fight and the near-miss non-kiss, so for about five minutes, Netflix just super wants to get you hammered. I AM FOR IT! DRINKING FREEEEE! Mistletoe? More like mistle-two in "The Princess Switch," as there's not only one romantic rendezvous under the holiday herb but a duo. Which frankly is too many. One scene of kids noticing a couple under the mistletoe? Cute! Two scenes? You start wondering if those youths are just little creepers. Anyways STICK TO THE DRINKING QUO! Magic deal with Santa/angel? I'm not sure what Mr. Fate's deal is, or why he's helping our Hudgenses instead of helping people really in need. (I know some kids in an orphanage who could've used some love!) Maybe Vanessa made some secret Faustian pact that she's unaware of. It's all a fairy tale now, but wait until she finds out her soul is owned by wily ol' Mr. Fate! Those are concerns for another time, though. For now? A DRINK TO REMEMBER! Anytime time you hear "Jingle Bells"? While we get a rousing piano rendition of "Carol of the Bells," we unfortunately don't get "Jingle Bells." Well, it was a nice rum of drinks there. I mean, run. *hiccups* NOW OR NEVER DRINK! Snowed in? Snowed in by the autoplay previews in the Netflix menu, maybe. Snowed in by actual snow, however? Nay. ALL FOR NONE! Considering this isn't an official Hallmark movie, it shouldn't surprise you that neither Cameron Candace Bure nor Lacey Chabert make an appearance. There's no snow on Christmas and no cynic to be won over by the holiday spirit either. But am I still going to have another drink to wash this movie away? And am I going to make another "High School Musical" song reference? Bet on it.